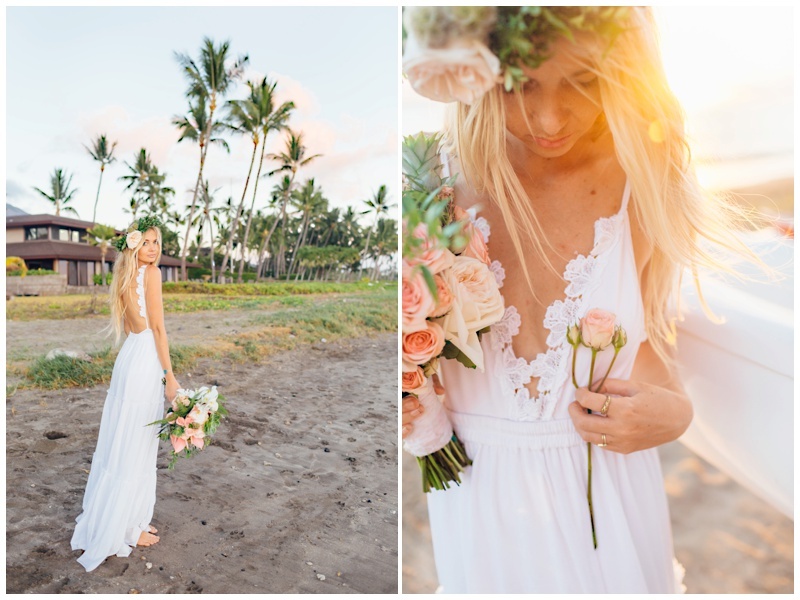 This bridal editorial took place on a beachfront private estate on the beautiful island of Maui. Tying together a little bit of bridal boudoir with a little bit of tropical swimwear, the perfect destination outfit is captured. The intimate 2-piece plays a dual purpose - taking on the role as a swimsuit first, but also being the perfect little garments to wear inside or while capturing a few images for a special someone. A cute combination for any bride who loves the sea or plans to travel sea-side. Most of these pieces are hand crafted - including the knitted bottoms and flowery triangle top. The bridal body suits are also personally designed. Brooke Larson, creator of Salt On the Rocks, designs beautiful bridal body suits and adds touches of detail to each one. The embroidering that traces the edge of each suit is personally selected and stitched on, including the "rose" and "flower" embroidering on the body suits styled in this editorial. To turn the bodysuit into a perfect wedding gown for a warm tropical night, simply add a high-waisted skirt to create a gorgeous fit for an empire-waist dress.